Just a month after Facebook officially acquired WhatsApp, the messaging app is adding one of Facebook Messenger's most annoying features: read receipts. WhatsApp, which boasts over 600 million monthly active users, has been slowly rolling out the system overseas during the last few months. But it's now finally caught the wider attention of the media and people who use the app, after the company updated its FAQ page to explain the new feature. 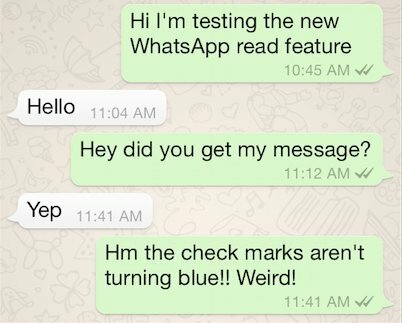 Previously, messages in WhatsApp had a single check next to them when they were sent from a person's phone, and a double check when they successfully arrived at a recipient's phone. This didn’t mean, however, that the recipient had actually read the message -- something WhatsApp even clarified on its official Twitter back in 2012. But now, those double checks will turn blue once the message has been opened. Some WhatsApp users started seeing this feature as early as September, and German news site Deutsche Welle reported on the update in June. The blue checks are apparently getting rolled out more widely now, but not everyone has them yet. When I texted an Android user from my iPhone, the blue checks appeared for her, but not for me. The new feature made its way onto WhatsApp on my iPhone even though I didn't download an update. Other reports said it has appeared on the Android version as well. WhatsApp has yet to release an official statement on the change, but it did add a section to its FAQ explaining the new service. 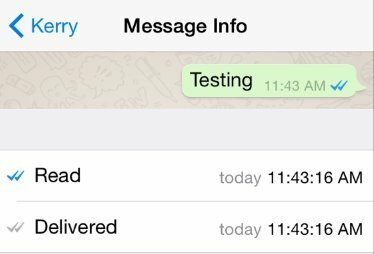 WhatsApp users can also now swipe left on iOS or tap and hold on Android to see what time a message was sent, received and read. Right now, there doesn't seem to be a way to turn off the feature. WhatsApp did not immediately respond to a request for comment. This change didn't come as a welcome surprise to every user, drawing frustration from some that they'll now have to admit when they are ignoring messages. 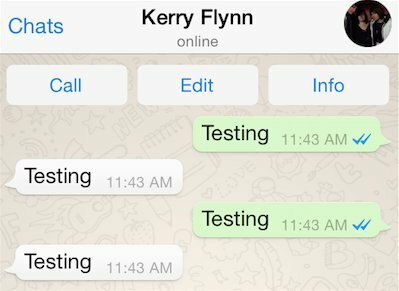 Before the rollout, WhatsApp users could find out whether or not contacts had at least opened WhatsApp by checking out the “Last Seen Timestamp” below their name. However, that setting could be removed. This new one cannot.